We have reposted this article that was published a few years back. Our photos were lost in the “Cloud” so we needed to redo the photos and publish again. This winery has been on West Dry Creek Road since 1986 when just a handful of wineries were located on this beautiful backroad in the Dry Creek Valley. In 2005 the winery became biodynamic, and in 2006 the winery’s original owners sold the winery to Pete Kight who had made it big in the high-tech business. Everyone waited with bated breath to see what changes would take in place at the idyllic winery. Pete Kight has not disappointed the Dry Creek wine community. Since the acquisition, the winery has added a beautiful and extensive vegetable garden of 120 raised beds, goats, a pig, and even a chicken “condominium.” Many of the vines have been replanted and additional acreage has been acquired. The winery has also added an extensive solar panel system atop its winery building. 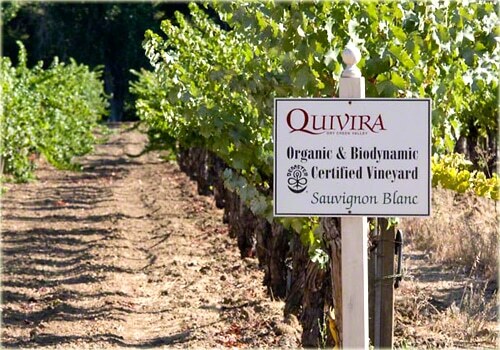 Quivira is one of the pioneer wineries in sustainable farming practices. Respected winemaker Hugh Chappelle is currently the head winemaker at Quivira Vineyards. In an effort to improve quality, the current production of wine has been reduced from over 20,000 cases of wine per year to 13,000 cases. The vines are thinned more, and much more of the crop is dropped to produce more complex wines. If you walk the vineyards you will get an idea of the replanting and see many examples of biodynamic farming. New acreage has been purchased in the western hills of Dry Creek and new vineyards are being planted with mostly Rhone varietal grapes. The best may be yet to come at Quivira. In the tasting room, the staff is friendly and accommodating. When we visited on a busy Sunday, the three Quivira staffers were welcoming a constant flow of visitors with ease while maintaining a festive atmosphere. Until Steven Canter took the realm as winemaker, Quivira flagship wines had been the Fig Tree Vineyard Sauvignon Blanc and the Dry Creek Zinfandel. These wines are still good, but the two wines we thought were more impressive were the Sauvignon Blanc Barrel Complete and the Wine Creek Zinfandel. The Sauvignon Blanc has been barrel fermented, and that gives a totally different character to this varietal. It is wine with more structure and it is delicious but on the pricey side at $28. The Wine Creek Zinfandel was the favorite of our tasting, a very delicious and balanced Zinfandel. If you visit Quivira, ask the staff if you can take a walk to view Wine Creek. Quivira Vineyards, along with other agencies and neighbors, has been involved in the restoration of this creek and the return of Steelhead trout and Coho Salmon. The winery has taken several steps to provide the correct environment for these fish to travel from the Pacifica Ocean up the Russian River to Dry Creek, and then to spawn in the pools of Wine Creek. What a wonderful endeavor. This is a guest post by H. Bruce Smith who runs Dry Creek Valley Wine Tours. Bruce suggested that I did not have enough consumer information on WineCountryGetaways.com about the Van-based wine tours vs Limos. Upon review I agreed with Bruce and asked him to provide us with a comparison. Van tours vs limos. Who has the best for the wine country traveler? 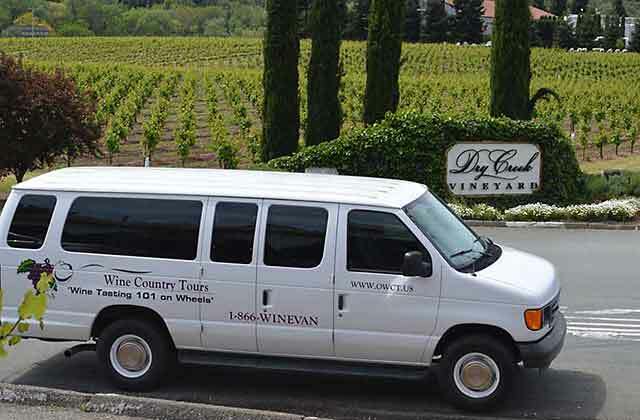 There are many benefits to booking a wine tour with a van-based service. While there are many sizes of vans, the smaller (8-15 passengers) are more likely to be of a personalized experience. Most tour companies of this size are either operated by the owner or knowledgeable staff to perform the tour. The key word here is “knowledgeable.” Often limo drivers know little or nothing about wine, while van drivers usually are well versed, not only in wine but the region itself. You should choose an experienced tour company if you want to get a better understanding of the wines of a particular wine region. Some van touring companies go one step further and offer wine tasting tips in order for their clients to better enjoy the tasting experience. While a limo driver may simply wait at the car, a van driver often accompanies the tasters into the winery. They often will introduce you to the winery staff, and if you’re lucky the winemakers themselves. Much of the fun of wine touring is enjoying the vineyards in a beautiful country setting. Vans are built for this purpose. With large tinted windows and an elevated seat height, you can take in the wine country surroundings. This is in comparison to the low riding limos with small dark windows. Finally, van-based tour companies are likely to offer complete packages. This can cover everything including a full lunch and all tasting fees. Your one cost for the tour can cover all expenseses, save any gratuity you deem appropriate and, of course, any wine you buy. Several years ago we visited the Truett-Hurst winery just after they had purchased the old Martin Winery on Dry Creek Road. Today the winery is vastly different in more ways than one. Make no mistake, the estate on Dry Creek Road is a delight to visit and the wines are very good. No wine is made at this venue, but the tasting room is nestled in among vineyards, gardens of wildflowers and vegetables, and the serenity of the Dry Creek stream flowing along the property. The tasting fee is $5 and you can choose five wines from a list of eight. The Rosé, the Sauvignon Blanc and the Red Rooster Zinfandel were among our favorite wines. All the estate vineyards are biodynamically farmed and any additional grapes that are purchased are from organically-farmed vineyards in the Russian River Valley. The most notable among the principal owners is Paul Dolan. His name is synonymous with Fetzer Vineyards and the Fetzer Family. Paul Dolan and the Fetzers were one of the first to farm biodynamically and were a great influence on other wineries to become biodynamic. The standout feature of this winery is the outdoor area, which is the perfect paradise for a relaxing picnic lunch in the vineyards. Just outside the tasting room are several tables where guests can enjoy tasting wine or munching on lunch. However, if you stroll just 500 feet beyond the tasting room, there lies Dry Creek on its way to empty into the Russian River. The winery has placed seating areas along the banks of the creek and it is the most wonderful spot to enjoy lunch or just the tranquility. We visited on a Tuesday around lunchtime and this area was occupied quickly. We imagine the area is very busy on weekends. We sat for a full hour just enjoying the musical sounds of nature. With a glass of Sauvignon Blanc, things cannot get much better. The winery makes 7000 cases of wine each year. The wines are made at their VML winery, located on Westside Road. Most of the wines are sold directly from the tasting room and a few others can be found at the Total Wine stores around the Sacramento area. The wines are very good and priced reasonably. It sort of takes the fun out of the concept of what we thought was a Family winery. Nonetheless, for now we highly recommend a visit to this winery for a tasting and, if not a picnic lunch, a walk around the amazing and beautiful grounds of Truett-Hurst. To get to Truett-Hurst, take the Dry Creek Exit off Highway 101 in north Healdsburg. Go west for about five miles. The Truett-Hurst tasting room is open daily 10 am to 5 pm. There are several other wineries along this stretch. Check our Dry Creek and West Dry Creek Wine Trails for our suggested wineries to visit. Traveling along Dry Creek Road near Healdsburg, there are numerous wineries to explore on either side of the road. But there are a set of wineries hidden from view that are clustered at Timber Crest Farms. Drive five miles west on Dry Creek Road from the exit at Highway 101. Watch on the right for the Timber Crest sign and the names of wineries. Drive up the short hill. We had been here before at Timber Crest visiting Peterson, Papapietro and Amphora. This time we scheduled a visit to Kokomo Winery and an interview with owner and winemaker Erik Miller. Eric took us out to the Timber Crest Vineyards where he purchases most of his grapes. The vineyards are on the east side of Dry Creek and these particular vines sit on a geological bench. The Timber Crest vines are farmed and managed by Randy Peters. He has been at work at these vineyards and others for the past 40 years and farming is his passion. Perhaps even more so now, because he and Erik are partners in Kokomo Winery. Kokomo’s first vintage was in 2004. Eric indicates that this has been a most challenging start to the 2014 growing season. The drought and the record-breaking warm temperatures of January are something not seen in the California wine country in many a moon. Erik points to the cover crops growing between rows of vineyards. Ordinarily, the cover crops at this time of the year are two feet high. Instead, this crop is only about two inches high. The cover crop is always plowed under, providing nourishment to the vines. The unusual warm and sunny days in January have advanced the growing season, so now the big threat is frost. If bud break comes early, the threat of frost increases. One good thing is that the east bench is high, and cold air flows downhill to the valley below. Back at the tasting room, manager Ross James gives us the lowdown on the wines and why visitors keep coming back to purchase the wines of Kokomo. Ross is a veteran of the wine industry, having mostly worked with the Jackson Family Wines. He is a master sales guy and knows how to encourage folks to join the wine club. There are 1700 members, and that is very impressive for a winery that makes 8,000 to 10,000 cases a year. Ross does not have to push too much because the Kokomo wines do sell themselves. We enjoyed all seven wines we tasted, and the prices are fairly reasonable when compared to other nearby wineries. For example, the Dry Creek Zinfandel was delicious and priced at $28. Comparable Zinfandels in the Dry Creek area could be as high as $35 a bottle. The interesting thing is that Erik makes so many wines each year, as many as 18 different labels. He says, “I have “ADD” when it comes to making wine. I make one wine and before I’m done, I think of another I should make.” The results are some interesting blends. Most of these are made is small case lots and go to the wine club. We quickly got hooked and joined the wine club. We love the Sauvignon Blanc, the Russian River Valley Chardonnay and the Dry Creek Zinfandel. The Pinot Noir is so delightful. My membership in a wine club is usually two years and then I move on to another. I like wine clubs that can offer me something unique and something not found in wine shops. Cheers to the Kokomo Winery! I think that overall their wines are excellent and, even better, value wines. Tasting room is open daily from 11 to 4:30 pm. Nearby are many other wineries to visit. Check our Dry Creek Wine Trail for additional wineries in the area. You can also find information on nearby lodging and restaurants. Visitors who drive along the Dry Creek Road in search of great tasting rooms often miss one of the best, the Sbragia Family Vineyards. It is a really fun winery with some terrific wines and one of the best views of the Dry Creek Valley. How is it possible to miss this winery? Well, the typical tourists begin their trek on Dry Creek Road from the town of Healdsburg or from Highway 101. There are so many inviting tasting rooms along Dry Creek Road that one seldom drives more than just a few miles before they have had their daily fill of tasting room visits. We have a suggestion for the next time you travel the Dry Creek Valley. Do Dry Creek Road in reverse. From the Dry Creek Exit, head West 10 miles to the last tasting room on this road, the Sbragia Family Vineyards. Then work your way back to Healdsburg and you will certainly be impressed with the very enjoyable group of wineries at this end of the Dry Creek. There are many things to like and enjoy at Sbragia Family Vineyards. First and foremost is the view of the Dry Creek Valley. Unless you own or rent a home in the hills of the Dry Creek Valley, it is doubtful that you’d find a better view of this Zinfandel powerhouse of a valley. Secondly, the deck at Sbragia is large and accommodating for a picnic or wine tasting. You won’t be bumping into other guests even on a busy weekend. Now to the wines! Ed Sbragia is the owner and winemaker. Need I say more? This man is a legend in the Napa Valley. He made wine at Beringer for 18 years and still is a consulting winemaker at Beringer and a few other wineries. Even the great Joe Montana enlisted Ed Sbragia to help and the two have collaborated on a label called Montagia. Ed Sbragia has estate vineyards in Dry Creek and elsewhere and uses his long-standing friendships with vineyard owners to garner some of the best grapes available. This all adds up to a wonderful tasting adventure at the Sbragia Family Vineyards. We met Ed at his Sbragia Family Vineyards tasting room and had a delightful visit speaking with him and tasting through his lineup of wines. He is a man of passion and conviction when it comes to his wines. He likes his wines to be “fruity, but not robust, and be distinctive.” Ed Sbragia grew up in the Dry Creek Valley and his father taught him his winemaking skills. While still at Beringer he began the Sbragia label and was making his wine in small amounts. It always had been his dream to own a winery and, by good fortune, the Lake Sonoma Winery became available in 2005. He snapped up the winery and his Sbragia label found its home. All the wines are well made and tasty but I think the Zinfandel wines are the standouts here. If you get a chance, try them and do a side-by-side tasting of three different vineyard-designated Zinfandels. It’s interesting to see what the different terroirs and winemaking treatments do to the same grape. It is a good learning experience. Pack your lunch or stop at the General Store on Dry Creek Road for a hearty sandwich or salad. The deck at Sbragia Family Vineyards has views of the valley in three different directions. What a way to enjoy an adventure in the Dry Creek Valley than to bask in the sun, sipping Sbragia Sauvignon Blanc, and taking in the view! Nearby wineries that are interesting to visit are Ferrari Carano and Dutcher Crossing. Three wineries in one day should be sufficient. Other wineries that we like on this route can be found on our Dry Creek Wine Trails. We are big fans of Zinfandel wines, especially from the Dry Creek Valley in the Russian River wine region of Sonoma County. The Dry Creek Valley is one of the prettiest wine country areas in California. This AVA (wine appellation) is small by most standards, only 16 miles long by two miles wide. Yet it is packed with small family-owned wineries, all producing delicious and tasty wines, especially Zinfandel. Nearly 2400 acres in the Dry Creek Valley are planted with Zinfandel grapes. If you like Zinfandel, you will love this two-day outing we have mapped out for you. If you don’t find Zinfandel wines to your liking here, you won’t find them anywhere else indeed! Make your home base the wine country town of Healdsburg. It borders the Dry Creek Valley and has numerous lodging accommodations, dozens of upscale restaurants and lots of boutique shopping. First stop is Seghesio winery in the town of Healdsburg, 14730 Grove Street. The winery began in 1895 and is famous for three different Zinfandel wines. You can play Bocce here and enjoy a picnic lunch under the Redwoods. After your visit, continue north on Grove, turn left onto Dry Creek Road and head to the Mauritson Family Winery. Mauritson is about three miles away on the right where Lytton Spring Road meets Dry Creek Road. Have you heard of Rockpile Zinfandel? 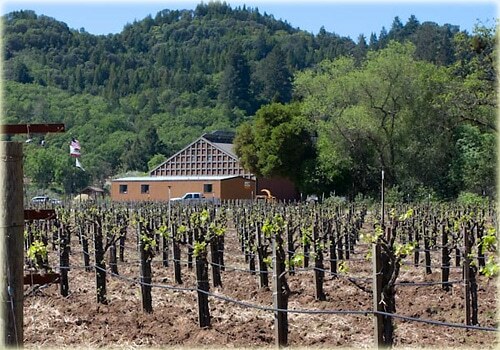 The Mauritson Family winery has 40 acres of vines in the rugged Rockpile region that sits above Lake Sonoma. A portion of the Rockpile AVA falls within the Dry Creek AVA. If you like big and bold Zin, Rockpile is it. Leave Mauritson and head up Lytton Springs Road to Ridge Vineyards. Ridge is another top producer of Zinfandel wines; our favorite is Ridge’s Three Valleys Sonoma Zinfandel, with most of the grapes harvested from the Dry Creek Valley. At this point you can call it a day and continue on Lytton Spring Road to hop onto Highway 101 back to Healdsburg. There are plenty of tasting rooms in Healdsburg just in case you did not get your fill. On day two, we head to West Dry Creek Road, perhaps the prettiest backroads in all of wine country. Watch for cyclists, joggers and walkers. This road is popular for outdoor activity because it is quiet, serene, and oh so beautiful. From Healdsburg, take Westside Road to the Madrona Manor Inn and turn right onto West Dry Creek Road. There are many good wineries along this backroad beginning with Everett Ridge. We also like the Lambert Bridge Winery. It’s one of our top spots to enjoy a picnic lunch in wine country. Another favorite spot is Quivira Vineyards, just past Lambert Bridge Road. The winery is certified biodynamic and makes many good wines including a wonderful Zinfandel. Down the road is Zichichi Winery. A former team physician for the New Orleans Saints owns Zichichi. Their Zinfandel is so good that it often sells out the day it’s released. Who knows, you may get lucky and find some of this Zin available to taste and purchase. Finally, we recommend a stop at the Bella Winery at the very end of West Dry Creek Road. It is a fun and busy winery and, best of all, Bella specializes in Zinfandel. After your visit to Bella, we suggest you backtrack along West Dry Creek Road and cross over to Dry Creek Road at Yoakim Bridge. Head back to Healdsburg along Dry Creek Road. I’m sure you will be tempted to stop at one or more of the many intriguing wineries you will pass on your way back to Healdsburg. On WineCountryGetaways.com you will get a complete list of the best lodging and best restaurants in the Healdsburg area. You can also find a list “Things to Do” should you need a break from your search for Zinfandel wine. Ask around the Dry Creek Valley about Duxoup wines and chances are nobody will have ever heard of this winery. I asked at two different tasting rooms to test my theory. One person thought I probably had the wrong name. The other was shocked to learn that such a winery could exist without her knowing about it. Winery directions on West Dry Creek Rd. No Duxoup! And that’s the way Andy and Debbie Cutter like it. They love the slow, easy life of making wine the way it used to be before wine country tourism became the thing to do. They make their wine in a gravity-flow wine cellar just below their home in the hills of the Dry Creek Valley. You won’t spot a single sign on the roadway to indicate a winery exists there. The Cutters do not have a tasting room, nor do they have any wine to sell out of the winery. Once the Duxoup wine is bottled, it is shipped off to the Sonoma Vintners Wine Co-op. Andy and Debbie do not want any part of the wine scene. They like the anonymity of their hidden wine country abode. The winery began in 1981 and it is fascinating that hardly anyone knows about it, except for the old-time winemakers who knew Andy and Deb during their early days. Andy began his wine career at Freemark Abbey and Deb at Franciscan Winery. Currently, they are making 1400 cases. They make some unusual wines for Dry Creek: Sangiovese, Dolcetto, Gamay Noir, and a Charbono. The only well-known varietal they produce is a Syrah, and it happens to be the only wine they sell that is over $20 a bottle. The Cutters source all their grapes except the Charbono from Ray and Lori Teldeschi, who have been farming their family vineyards for 50 years. The Charbono comes from the Friediani Vineyards in the Napa Valley in Calistoga. We met up with Andy Cutter with our friends and fellow wine bloggers, Mike and Mary Beltran. Mike met Andy in the early 1980’s when Andy was peddling his wine to a Sausalito wine shop where Mike worked as wine buyer. Andy has some amazing wine stories to tell, especially the ones about his great friendship with famed winemaker Andre Tchelistcheff. While we sat and conversed, Andy opened a bottle of his 2010 Charbono. Two-thirds of the Charbono is new vine, averaging around 30 years old. The last third comes from old vine Charbono over 100 years old. The vineyard workers drop fruit in the new vines, but the old vines produce few clusters and in a sense thin themselves, so no need to physically drop the fruit. The Charbono was quite tasty and as Andy told stories, the wine just seemed to get better and better. Andy and Deb make wine the old-fashioned way. The wines are on the lighter, less oaky side, and pair nicely with food. Just one example of Andy’s approach to making wine: Andy purchased an outdated wine bottle machine from Lava Cap winery in El Dorado County. The wine enters the bottle via gravity flow, but Andy thought that was too fast for the wine. He wanted it to be a much slower fill, very gentle on the wine. He and a friend invented some pressure adapters above the machine to slow the pace below gravity speed. Can you imagine! If you want to try any of the Duxoup wines, they are best obtained through retailers and restaurants by way of their distributors. The distribution partner here in California is Springboard Wines. Note: Bistro Ralph has closed its restaurant. On the spur of the moment, we decided to take a quick overnight trip to the wine country in the Russian River area. We have a couple of favorite spots in this area that we love to visit during the Fall. The colors are absolutely beautiful in the Dry Creek Valley, the Alexander Valley, and the Russian River Valley. Besides the Fall colors another good reason to travel at this time of year, and in midweek, is that you can get a better lodging rate and things are much less crowded everywhere you go. We found a room at the Best Western Dry Creek Inn for a measly $69. The room is in the new Tuscan center of the hotel and has a fireplace, large screen TV, and a Jacuzzi tub. We don’t really need those things but why not take them if they come with a room that normally prices well over $200? For you travelers to Healdsburg, this online midweek offer is probably going to continue to run during the winter months.